Loïc’s impressive experience and qualifications exemplifies his passion for sport; demonstrating a deep understanding and expertise in a multitude of sports performance areas. He is a recognized expert in athletic performance evaluation, specifically; functional movement optimization and analysis. In the past ten years some typical clients he has worked with include, the French National Team in Gymnastics, Premier Football League Arsenal FC and Ladies European Tour for Golf. In addition, his research in biomechanics conducted on Alain Bernard was used in the preparation of the 2008 Olympic Games. As Founder of Physio Consult, he established a first class center; dedicated to sport trauma and physical therapy since 2009. At the same time, Loïc began working with TPI due to his interests in the impact of movement’s efficiency on performance in sport. Looking to combine all of his competencies, he has recently founded, Be Athletik which will focus primarily on preparation and performance, lessening risks of post sport trauma. It will also incorporate a larger inclusion of cutting edge technology to the mix, further establishing his niche qualifications and knowledge. He uses only the latest equipment including; Trackman and AMM 3D. Techniques he uses consist of Functional Movement System (FMS), Athlete’s performance (AP), and TPI. At TPI, he has succeeded a certified Level 3-Medical pro, Level 2-Golf pro and golf biomechanics. 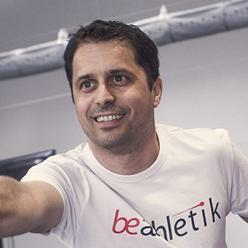 Moreover, he is actively involved in R&D with several companies namely; All-care Innovations and Design Physio, contributing to the development of new innovative products which all have a future in his services at Be Athletik. He has received his MA in Physical Therapy, as well; he acquired one diploma specializing in Osteopathy and Manual therapy of neuro-integrated systems. He is an avid athlete who enjoys all physical activity and sport. As a young adult he participated at the competition level, swimming, gymnastics, skiing and golf. His passion gleans from his personal and professional experience.